How the pioneering musician can help shake you out of a culinary rut. In 1975 legendary musician and producer Brian Eno—along with artist Peter Schmidt—created a deck of instructional cards designed to disrupt conditioned thought processes and spark creativity. 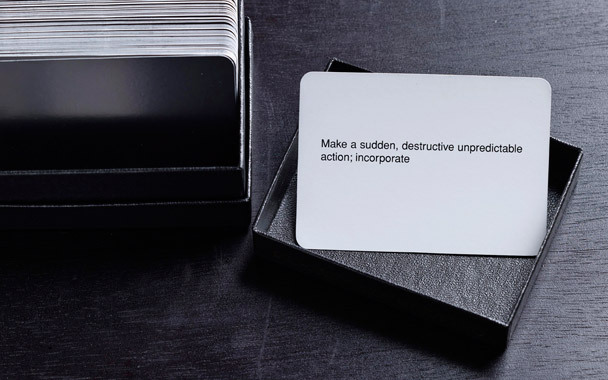 Modeled on the ancient Chinese I Ching (or Book of Changes), the Oblique Strategies have a cult-like following that primarily comprises musicians (U2, Coldplay, David Bowie) who use the cards during the songwriting and recording process. With directives such as “Humanize something free of error,” “Make a blank valuable by putting it in an exquisite frame,” and “Gardening, not architecture” the cards can either be used together, as “a set of possibilities being continuously reviewed in the mind,” or individually, with a new card drawn each time a creative dilemma arises. At that point, “the card is trusted even if its appropriateness is quite unclear.” The card is not necessarily meant to be a final suggestion and may simply act as a bridge to newer ideas. So how does the deck really hold up in the kitchen? The mussels and basil were already ordered and on their way, so Ian asked Melissa for advice; she suggested pasta. Ian cooked the mussels and pasta and tossed them with the basil, and that’s when the strategy came into play: “There’s an Italian no-no when it come to eating fish with cheese. It’s rarely done. Because it’s such a faux pas, I would never have gone there. But because the card said I should, I did.” In the end, Parmigiano-Reggiano added depth with out strong-arming the more delicate flavors in the dish. Right away he knew he wanted to use cream because, as he told me, “extravagance always leads me to only a handful of ingredients, and one that springs to mind immediately in the summer is cream.” He had a start. He went back to the Strategies and drew: “Define an area as ‘safe’ and use it as an anchor.” One very safe bet was strawberries, and, as Ian reasoned, no one has used them as a more effective “anchor” than yogurt makers. The result: Fruit-on-the-Bottom Tapioca Pudding, extravagant and creamy with an anchor of summertime fruit. If cooking is an art, then it is certainly prone to the same creative complications and trials as other arts, like writing, painting, or used-car sales: a temporary loss of mojo, a doused spark, a creative block. Or specifically, in this case: chef’s block. With that in mind, it seems reasonable that Oblique Strategies might be considered as handy a tool and as inspirational as Harold McGee’s On Food and Cooking or perhaps even the Larousse Gastronomique. Sometimes even a clever cook needs a little philosophical guidance. After all, if the Oblique Strategies can inspire the best from Bowie and Bono, just think what they could do for Batali and Boulud.